If you’re planning a move to Hawaii, I recommend that you rent a home (rather than buy a home) for at least your first year in the islands. This will give you time to make sure you really want to stay put in that neighborhood, in that city, on that island, or even in Hawaii at all. Because of my recommendation, this next series of posts on home-hunting will focus on the rental housing market. However, I do plan to write a series of posts on house-buying in the not-so-distant future. So today let’s address the first thing you need to know before you start looking for a rental home in Hawaii: what your price range is. Once you’ve determined how much you can afford to spend on your monthly rent, you’ll be able to target your search and avoid wasting time looking at rentals that are beyond your budget. Step 1: Determine what your monthly income in Hawaii will be. If you already have a job in Hawaii, then you know how much you get paid each month. And if you’re retired or independently wealthy, then you know what your monthly “allowance” is for covering all your expenses. But if you don’t have any source of income in Hawaii yet, you’re going to have to do some estimating. If you’re fairly confident that you can find a job in Hawaii doing the same type of work you do now (or did up until now), then use a salary calculator to see what employers in Hawaii would probably pay you for doing that job. If you’re not sure you’ll be doing the same kind of work in Hawaii, then take a look at the U.S. Bureau of Labor Statistics’ list of mean (average) annual salaries in Hawaii for a wide variety of occupations. Keep in mind that these are averages, so if there’s an occupation you can see yourself doing but you’d have to start in an entry-level position, your salary is bound to be lower than the average. Another way to estimate what your new job in Hawaii might pay is to look through job listings to find salaries posted for jobs that you’re qualified for. It can be difficult to find posted salaries for jobs at private companies, but listings for state, federal, and city/county government jobs usually include salary info. Step 2: Add up your monthly expenses in Hawaii other than rent. The amounts for each of your expenses should reflect what it would cost in Hawaii. So if you’re not yet living in Hawaii, you’ll probably need to adjust your current expenses to Hawaii’s cost of living. 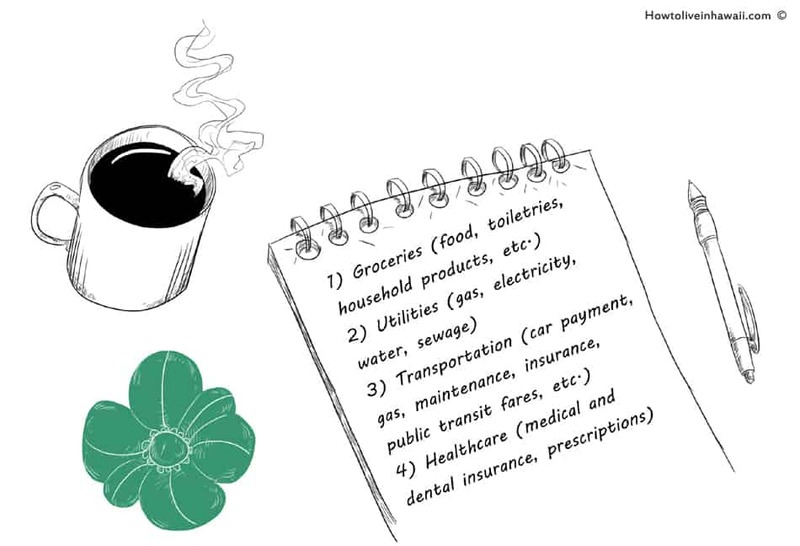 To do that, use the same salary calculator mentioned in Step 1 to see how much more (or less) things cost in Hawaii compared to your current city. The calculator’s results will show you cost differences in five categories: Groceries, Housing, Utilities, Transportation, and Healthcare. Ignoring the Housing category, use this information to adjust the amounts of your expenses that fall in those categories. For example, let’s say the calculator’s results show that groceries cost 50% more in Honolulu than they do in your current hometown. Multiply the amount you currently spend on groceries each month by 1.50% to calculate how much that expense would be in Hawaii. So if you currently spend $300 a month on groceries in your current hometown, you’ll probably be spending $450 a month on groceries in Hawaii. Take your monthly income in Hawaii and subtract your total monthly non-housing expenses in Hawaii. The result is the maximum rent you can afford in Hawaii. This rental data is for the entire state of Hawaii. Rents can be significantly lower and higher than the amounts listed above, depending on where the apartment is located in Hawaii. To view Hawaii’s Fair Market Rents by county and for non-metro areas, visit NLIHC’s website. $2,700: Honolulu, Oahu: 3 bedrooms, 3 bathrooms, 2-car garage, fenced front yard, full kitchen but no dishwasher, downstairs rec room with partial kitchen, unfurnished except for large appliances, yard service included. $2,350: Kapolei, Oahu: 3 bedrooms, 2.5 bathrooms, 1,393 square feet, 2-car garage, fenced backyard, community pool membership, full kitchen including dishwasher, unfurnished except for large appliances, built in 1996. $1,850: Wailuku, Maui: 3 bedrooms, 2 bathrooms, 1,423 square feet, 2-car garage, fenced backyard, central air conditioning, full kitchen including dishwasher, unfurnished except for large appliances, built in 2008. $2,100: Kihei, Maui: 3 bedrooms, 2.5 bathrooms, 2-car garage, fenced backyard, central air conditioning, full kitchen with dishwasher, unfurnished except for large appliances, water and yard service included. $2,100: Kailua-Kona, Big Island: 3 bedrooms, 2 bathrooms, 3-car garage, large backyard with ocean views, central air conditioning, full kitchen, unfurnished except for large appliances, water and yard service included. $995: Pahoa, Big Island: 3 bedrooms, 2 bathrooms, 1,400 square feet, no garage, large unfenced yard, full kitchen including dishwasher, unfurnished except for large appliances, fully restored 1940′s plantation manager’s house. $1,600: Kapaa, Kauai: 3 bedrooms, 2 bathrooms, 2-car garage, fenced front & backyard, central air conditioning, full kitchen including dishwasher, unfurnished except for large appliances. $1,950: Kalaheo, Kauai: 3 bedrooms, 2 bathrooms, 2-car garage, fenced backyard, air conditioning in master bedroom, full kitchen including dishwasher, unfurnished except for large appliances, landscape maintenance included.